Chili’s used to be one of my favorite joints while I lived in Starkville, USA. 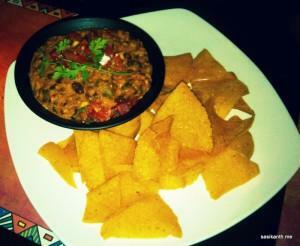 Whenever I was bored with the same food, Chili’s Black-bean Burger was the savior. I’ve been wanting to visit the Indian outlet for a long time, and finally, on a Monday evening, here I was for a tasting session. The ambience was almost exactly the same as in the States, and I made myself comfortable at a corner booth. The chef suggested that I try some of their best sellers, and I obliged. So I started off with a small portion of Texas Cheese Poppers and Fried Quesadilla bites, along with a Virgin Pina Colada. 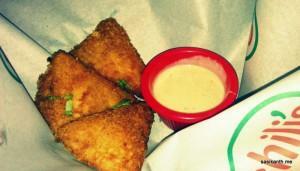 The Texas Cheese Poppers were served in quick time, along with Chipotle Sour Cream. First impression, they were greasy. They tasted good, with cheese melting in my mouth, but the oil was bothering me. The cheese was oozing out oil as well, so. The Fried Quesadilla Bites were served along with Chipotle Ranch, and these turned out to be excellent. With grilled paneer and cheese, this was a definite winner! And the ranch tasted better than the sour cream. The Pina Colada arrived soon, and tasted good. The pineapple was pretty dominant. Next, I wanted to taste their Queso, and so asked for a small portion. I was told that it’s usually served on a skillet, but they made an exception and gave me a bowlfull. 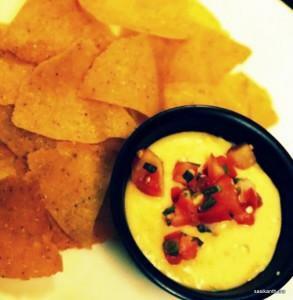 While the Queso was good, the chips didn’t catch my fancy. I found them pretty heavy, and would have preferred lighter chips. It was now time for Texas Cheese Fries. 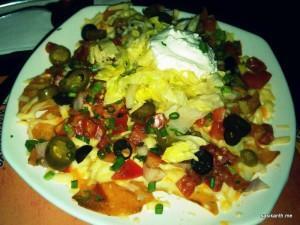 Loaded with Terlingua Chili, veggies and tons of cheese, this looked yum. However, on taste front, it was just alright, for I really didn’t enjoy the chili much. Nevertheless, the cheese and fries were yum yum. For the main course, I asked for a Veggie Bite Burger, and a portion of their Veggie and Cheese Quesadilla. 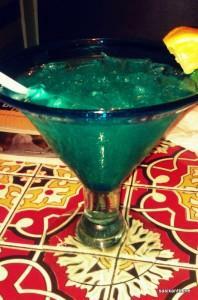 But first, another drink; Blue Pacific. Served in a Martini glass, this tasted very different. Different good. The burger turned out to be decent. The bun was toasted, and the patty was good. 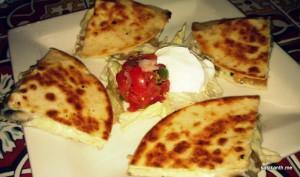 The Quesadilla, served with Pico de Gallo and sour cream, was again a winner. With tons of mushrooms, home-made cream sauce and cheese, this turned of to be excellent. On the downside, I found the texture of the cream sauce to be too thick; would have preferred it to be lighter. To finish things off, I asked for the Molten Chocolate Cake. The chef suggested Chocolate Chip Paradise Pie, but I was in no mood for caramel, so. This turned out to be good; chocolate was oozing with every bite. However, the cake was overbaked, and so, a little too dry. Overall, a satisfactory meal. Food was decent and drinks were great. Of the starters, the Fried Quesadilla was worth it. The service was impeccable, with the manager Pavan attending to my every need. The chilled out ambiance gives this place a definite edge. They might be priced a little on the higher side in general, but their value meals for lunch and dinner are a steal. 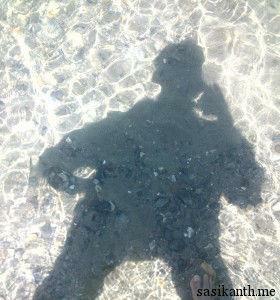 Bottomline, nothing exceptional but worth a visit. Was invited to the opening of the new Tex-Mex restaurant in town, so dropped in to give it a shot. The place was very well done and the ambiance was pretty neat. There were few other foodies invited along with me, and we were also seated in the private dining area. The owner of the brand and the chief chef came in to greet us foodies and make us comfortable. 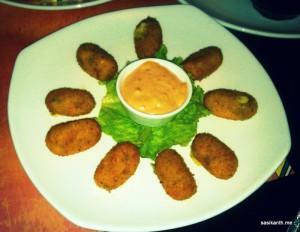 They briefed us on the brand, the variety of food, and the experience one can expect at Habanero. 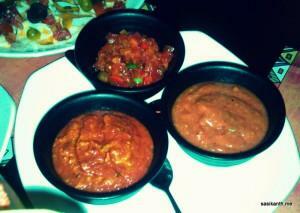 Chips were served as we settled down, with three different types of Salsa – Spicy Chilli, Cucumber and Papaya. I liked the chilli sauce but wasn’t really impressed by the other two. The tortilla chips on the other hand turned out to be light and crispy; perfecto! The veggie crowd soon ordered for a portion of Macho Nachos, Jalapeno Poppers, and Queso Dip. The Nachos came in first and looked quite loaded. Tons of veggies, salsa and sour cream with yummy cheese – perfect way to start the meal. While the chips tasted yum, I would have preferred more cheese topping. 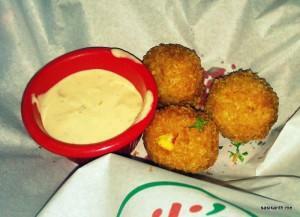 The Jalapeno poppers were in next and were served with a flavoured mayonnaise dip. These were good but nothing spectacular; the cheese was there but the jalapeno weren’t ripe, and so the required punch was amiss. Apparently, the restaurant has been facing problem sourcing the right quality jalapeno. They did serve a variation with chopped jalapeno instead of stuffed ones, and this turned out to be more of cheese poppers than jalapeno poppers (not that I was complaining 😛 ). 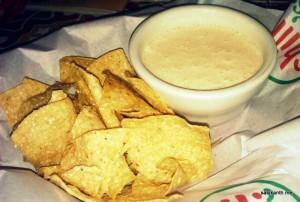 The best of the lot however turned out to be the Queso dip. It was served along with some more chips, and man, it was excellent. Creamy and cheesy, just perfect. We were so in love with it that we ordered for another portion; this again tuned out to be excellent and was finished in a blink. So we now ordered for a third portion; and bam! This now turned out to be the worst dips I’ve ever tasted. The creamy cheesy dip was gone and this one turned out to be some kind of gooey stuff with absolutely no taste. One of the foodies actually said it tasted like broken cream. Disappointed. Anyway, while the Queso saga was on, we ordered for more starters; Messy Bean Dip, Zucchini Fritters with Tomatillo Relish and Tostada Salad. 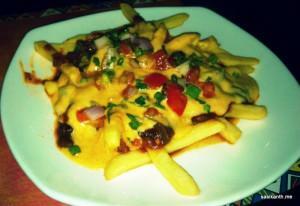 I was also tempted to taste the Chilli Cheese Fries, so ordered for the same. 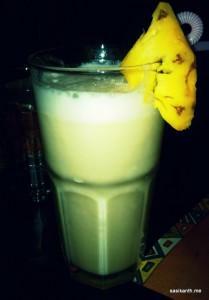 But before that came my drink – Softie Colada. 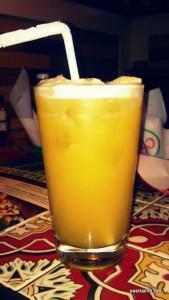 This turned out to be a refreshing drink; it had a distinct coconut taste, and was as perfect as it could get. The Messy Bean Dip arrived again with more chips. This turned out to be good, but I would have preferred it to be a little more spicy. It actually reminded me of the Rajma curry we make at home. 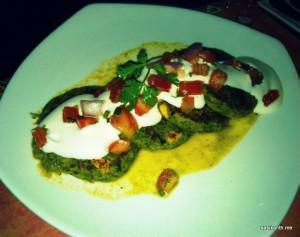 The Zucchini Fritters tasted very different from the regular stuff, and turned out to be excellent. The Tomatillo sauce (Tomatillo, also called Mexican Tomato, is a kind of gooseberry) had a tangy taste to it and went perfectly well with the zucchini. One of the best dishes of the day! 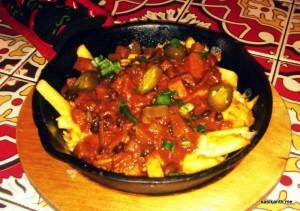 The Chilli Cheese Fries turned out to be another version of the Macho Nachos. The cheese sauce was good, but the fries were very soggy. I had to eat this using a spoon and fork, so you can imagine. They weren’t bad, but definitely didn’t suit my palate. 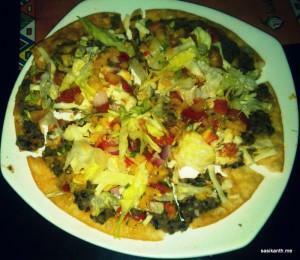 The Tostada Salad turned out to be a Tortilla topped with different veggies. The crunchy base actually made this taste good. 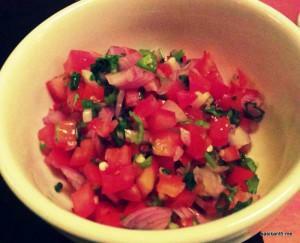 While we were munching on the food, the chief chef Dan walked in to make some Pico de Gallo salsa for us. He actually wanted to make Guacamole, but they were out of avocados, so. He started from scratch, and voila, in about 5 minutes, we had another dip to taste. This turned out to be a very very spicy dip, with the spice hitting the throat after a while. Though I was almost in tears, I enjoyed it. 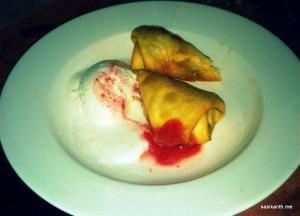 While we were stuffed, it was now time to taste the main course; Tacos and a Chimichanga. 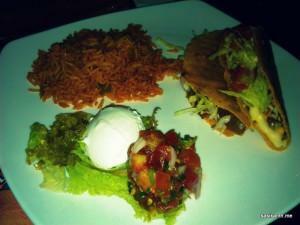 Two stuffed Tacos were served along with Mexican rice, salad and sour cream. While the Tacos were good, the rice turned out to be disastrous. It was uncooked and lacked any kind of flavor. 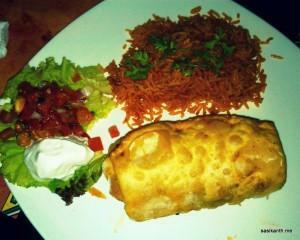 The Chimichanga, served with same disgusting rice, turned out to be crunchy and stuffed well. It could have done with a little more cheese stuffing though. Finally time for desserts. 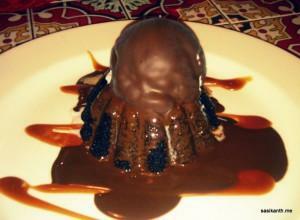 We wanted to have the Molten Mexican Chocolate Cake (stuffed with chili powder) but they were out of it. We wanted to have the Tres Leches Cake, and they were out of it as well. They were actually out of everything but for Churros and Snickers Chimichanga. While I prefered neither, Chimichanga it was, again. And as I guessed, this wasn’t for me. Too sweet for my liking! Overall, an average meal. While some of the dishes were very good (Queso was exceptional but only the first time around) consistency seemed to be a major issue. Actually, a few days after our gathering, there was another foodie meet here, and most of them complained about the food. Not surprising as we experienced something lack of consistency in a single meal. So that’s something they definitely need to work on. 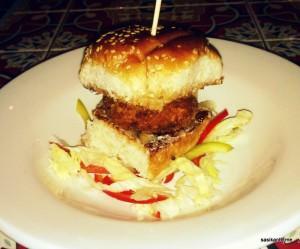 Food apart, the place has great ambiance, perfect for small parties and get-togethers. On money front, everything seemed reasonable, and I was told that they are cheaper than competition.